A heavy duty hand Meat Chopper. Includes Flywheel a self sharpening blade with a general purpose medium cutting plate. This unit is larger then the 113 chopper. Grinds approximately 5 lbs. of meat per minute. 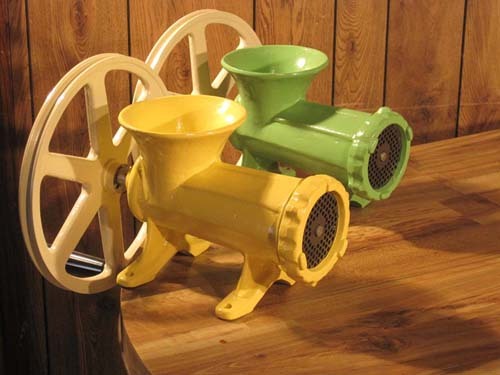 This meat grinder can be used to grind sprouted grains, grinding masa dough directly from wet nixtamal (corn boiled in alkali), wet corn or any other grains. Feet are designed for secure permanent bolting. We have all the parts available for this model. Please e-mail us to service@retsel.com for prices and availability. All our products are made in USA. Due to our strict quality control standards and supplier manufacturing deadlines our delivery time may vary depending on which color and item you select. The standard delivery time on all our products, repairs and special order items is 1 to 2 weeks at this time. Please call us at 208-254-3737 during our regular business hours before placing your order to find our current delivery schedule is at this time.